These traditional, floral art prints feature hand-torn deckled edge detailing. Various shades of green, brown, white, gray, blue, and yellow are shown in each of the prints. 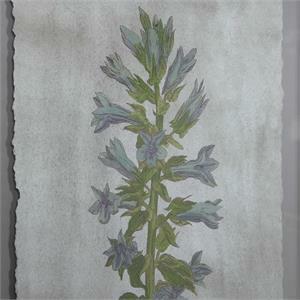 The hand-torn prints are placed against a stone gray background and are surrounded by a simple, thick white mat. 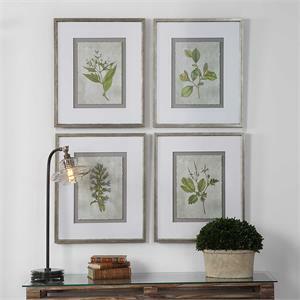 Elegant champagne silver leaf frames complete each botanical print. Each print is set under protective glass.